This group exhibition features fifteen artists who utilize sewing, knitting, and weaving to create a wide-range of works that activate the expressive and conceptual potential of line and illuminate affinities between the mediums of textile and drawing. Multi-generational and international in scope, Thread Lines brings together those pioneers who—challenging entrenched modernist hierarchies—first unraveled the distinction between textile and art with a new wave of contemporary practitioners who have inherited and expanded upon their groundbreaking gestures. Thread Lines was organized by The Drawing Center, New York in conjunction with Louisville’s Kentucky Museum of Art and Craft and curated by Joanna Kleinberg Romanow. The geographical location of this exhibition seems fitting, considering the rich tapestry (pun totally intended) of domestic and folk art varieties in Kentucky. Thread Lines had a large number of artists’ works in the exhibition. Fifteen international artists total: Mónica Bengoa, Louise Bourgeois, Sheila Hicks, Ellen Lesperance, Kimsooja, Beryl Korot, Maria Lai, Sam Moyer, William J. O’Brien, Robert Otto Epstein, Jessica Rankin, Elaine Reichek, Drew Shiflett, Alan Shields, Lenore Tawney, and Anne Wilson. The works ranged from embroidery a la Elaine Reichek’s Perhaps My Love (2012) and Desire, Dread, Despair (2012), to Beryl Korot’s landmark digital textile drawings such as Weaver’s Notation-Variation 1 (2012), and back to Lenore Tawney’s free-hanging abstraction made of linen Union of Water and Fire (1974). I’ve chosen four works that stuck around with me for the rest of the afternoon. Detail from Sheila Hicks’ “Forêt Blue” (2001). Sheila Hicks, “Transporter 3 Fois” (2009), “Lonely Monday” (2007), “Falcon and Eye” (blue, gold), and “Foret Blue” (2001). Images courtesy of author. Sheila Hicks is well known for her large fiber and textile woven installations. An American artist whom studied under Joseph Albers at Yale and, after being encouraged by Albers’ wife, Anni, to travel, travelled to Colombia, Peru, and Chile among others and was heavily influenced by the textile works of the region. Hicks has been making bulbous ball-like installations for a while now, and has generated much acclaim for herself. In opposition to her large scale abstract installations; her minums are beautiful and quirky little textile works made out of “stuff”such as wool, linen, silk, hemp, bamboo, quills, feathers, twine, yarn, and thread amongst other things. It’s rumored that Hicks has been working on these tiny works, or really, textile sketches, for about 50 years. The four small (ranging in size from roughly 9”x 8” to 12” x 8”) are simply lovely, for lack of a better word. 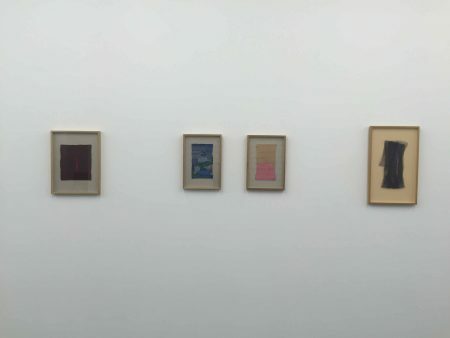 Hicks’ four works: Foret Blue (2001), Falcon and Eye (blue, gold) (2009), Lonely Monday (2007), and Transpercer 3 Fois (2009), are small, intimate, and poetic in their approach. If Hicks’ large installations are novels, than these minums are haikus— brief, coded, and not without set perimeters. 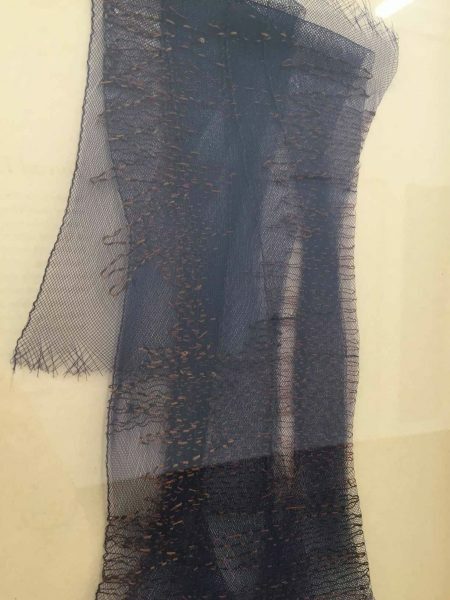 Her hand-stitching with Foret Blue is delicate, ephemeral, and sensitive. Kimsooja, a Korean artist whose works and projects include everything from performance, video, sewn works, installations, objects, as well as print media lent her 16 mm film Thread Routes: Chapter 1 to the exhibition. On KMAC’s second floor gallery, a video viewing space sseperated off from the rest of the exhibition had the roughly 30 minute film playing on a loop. I was unfortunate and wasn’t able to attend the opening or curator talk on this exhibition; but I was fortunate enough to go and see the show on a Wednesday in the late afternoon, and so I got to watch all 30 minutes of Kimsooja’s Thread Routes: Chapter 1 (2010) without interruption. Still from Kimsooja’s Thread Routes: Chapter 1 (2010). Image courtesy of author. Thread Routes: Chapter 1 is the first in a six part series that films indigenous textile making while taking into account the landscape in which these textiles are made. Chapter 1 is set within the great Machu Picchu of Peru. 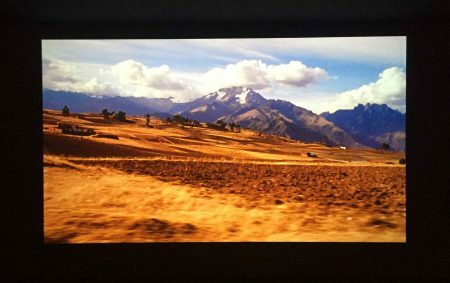 The film showcases the continued use in Peruvian weaving of ancient methods of separating out and winding fibers on the simplest of looms— consisting of not much more than sticks, scraps, and strings. 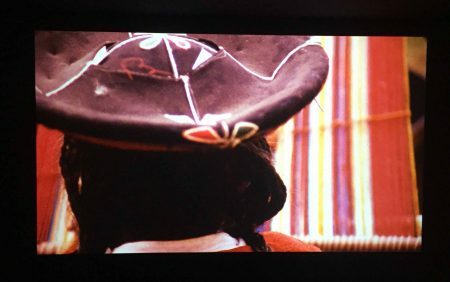 To say that these films just “document the perforative elements of various indigenous textile forms” is a crass, academic, boiling-down of the series. Kimsooja maintains splendid formal cinematic elements— her usage of color, composition, sense of scale, and movement (both in high speed and complete stillness) are great examples of good film. More importantly, Kimsooja focuses on the quiet, the focus, and the slowness at which these textiles are created. This isn’t about textiles, it’s about human pace, work, and family. As I watched, I kept returning to the craftswoman: what was she thinking about? What mundane stuff is she tossing over in her head as she looms and works in a pattern that she certainly has committed to muscle memory? Another small group of works that got me were William J O’Brien’s small, hand stitched, felt, embroideries. 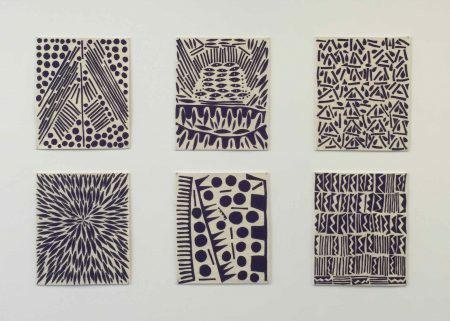 O’Brien’s works (all titled Untitled (2013)) are off white felt with pieces of navy, hand-cut, semi-organic shapes that were hand stitched with similar off-white thread. The pieces are simultaneously meticulous and casual. They reminded me of other modern artists—Basquiat, Yayoi Kusama, and Keith Haring to name a few— but when looking at them within the context of the rest of O’Brien’s work, which is predominately large-scale ceramic and mixed media works, along side painting, they seem quieter, and less academic than the artists mentioned. O’Brien’s work typically shows an appreciation for American folk art while not making it precious. But these seem precious, they’re tenderly hung with little more than t-pins, and grouped together like old friends. On the very back wall of the gallery, you’ll find four little hand stitched napkins, in minimalist stitchings and folds: Louise Bourgeois’s Untitled (2007), (2003), (2005), and Hairy Spider (2001). 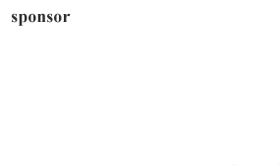 All of which were created in the years leading up to Bourgeois’s death. The French artist, known primarily for her sculpture, began returning to her early work as a restorer of antique tapestries, seemingly as an ode or remembrance to her youth—she learned about restoration of textiles from working for her family’s business. Bourgeois collected napkins and other small textiles her entire life. She utilized these prized objects to create minimal, hand-stitched drawings. The quiet placement of such important works was an excellent way to end the experience of the exhibition. In retrospect I have one criticism: The lack of three dimensionally presented works. It was an apparent irony that that all of the works were technically three dimensional works of sculpture (with the exception of Robert Otto Epstein’s drawings of material patterning within knit sweaters), but presented well within the traditionally presented two dimensional framed cannon. I’m sure that it was an intentional decision; but the space, despite being filled with excellent works, felt lacking in weight. None the less, Thread Lines is an excellent exhibition placed within a geographical context relative to it’s meaning and make— Kentucky has long held a history of domestic arts and crafts, as well as folk art. The decision to take this exhibition from it’s originator in New York and place it within the walls of the KMAC was a sound one, honoring the traditions of both domestic and folk arts through a modernist and contemporary lens, and also realizing Kentucky’s traditions within a greater global context. If you find yourself in Louisville before August 6th, 2017; you should swing by the KMAC’s 2nd floor gallery—it’s well worth your time and appreciation.